For the safety of your family and pets, it is important to remove any harmful bacteria or fungi by cleaning all surfaces of your household, especially the carpet. Asbestos is a mineral fiber that was used in the walls and ceilings of some older homes because of its strength and heat resistance. But it was discovered in the 1920s that asbestos exposure can cause lung damage and other health problems. 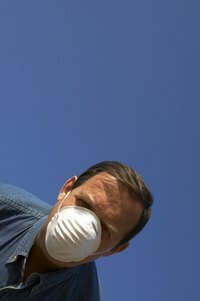 The Environmental Protection Agency has studied the most effective techniques for removing asbestos from carpet. Put on the mask and eye protection and remove all furniture from the affected area. Asbestos may become airborne during cleaning and resettle on other surfaces. If there is a significant amount of asbestos particles present, consider carpet removal as an option. Keep in mind that the amount of airborne particles will increase during the removal process. Dry vacuum carpet to gather the loose particles from the fibers. Airborne asbestos increases significantly during cleaning so It is essential to use a vacuum with a HEPA filter. Wet vacuum the carpet thoroughly. Using a wet vacuum will remove the most amount of asbestos and should be repeated at least a few times a year. Frequent dry vacuuming will keep asbestos levels low in high-traffic areas of the carpet. Wipe down all other surfaces thoroughly with a damp cloth to remove any particles that may have settled on them during cleaning. Cover skin completely and wear protective gear such as face masks and goggles to protect skin, eyes, nose and mouth. Prolonged exposure to asbestos can cause lung disease and tumors.